There is no doubt about it, dresses are my favorite thing to wear. They are simultaneously put together and effortless. I mean who doesn’t like an outfit that involves only one article of clothing? The things is, I desperately need separates in my closet. I have been wanting to make Rue as a skirt for ages, and I am so glad I finally got around to it. This skirt has some serious style, a little bit of drama, and garnered a whole lot of compliments. If Rue is a compliment dress, then it is also a compliment skirt. 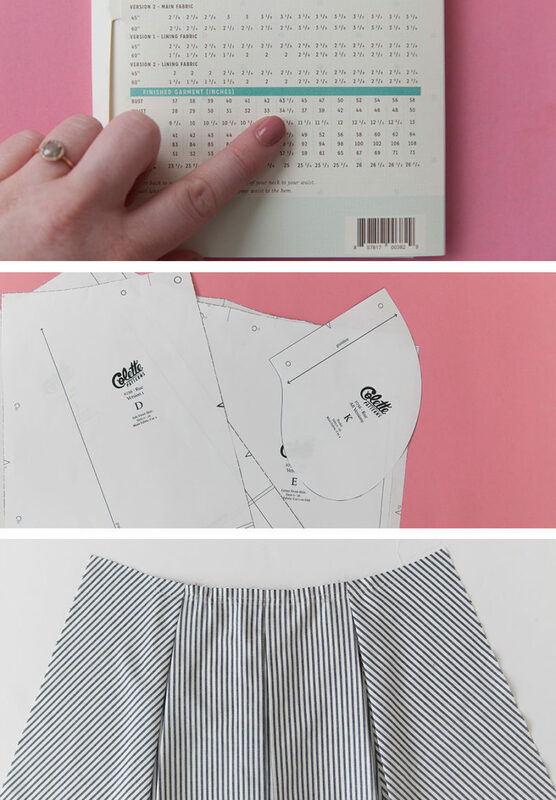 Here is the scoop on how I made my Rue into the skirt of my dreams. Determine your size based on the finished measurement cart. Often times you will want a little less ease in the waist of a skirt than in a dress. Aim for somewhere between 1/2″ and 1 1/2″ ease. Cut or trace pattern pieces D, E, F, and K. Pattern piece K (pockets) are optional. I chose to make mine with pockets, because pockets! Cut fabric, paying attention to the directionality of the fabric. Be sure to reserve a small amount (about 1/4 yard) for your waistband. Assemble the front skirt according to the pattern instructions. Staystitch the pleats on the back skirt. Attach the pockets if pockets are your thing. Cut 2 back waistbands and one front in both fashion fabric and interfacing. Fuse interfacing to the wrong side of the waistband pieces. 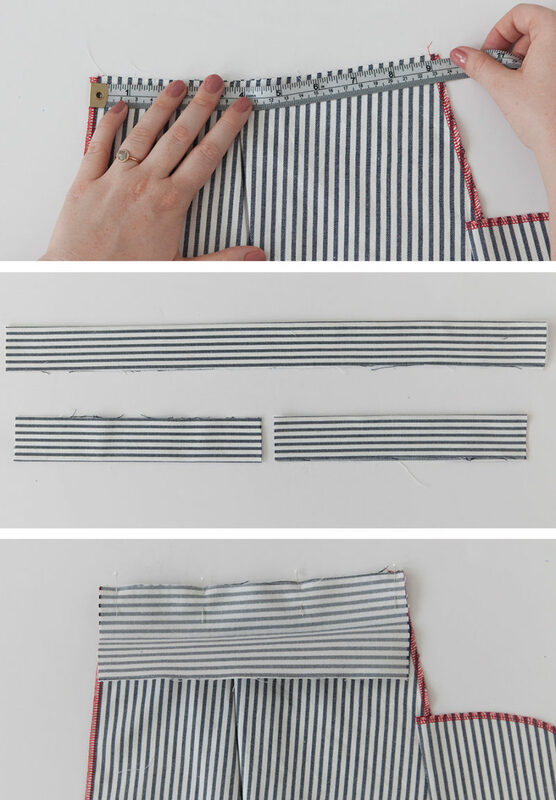 Press the waistband pieces in half long ways. With right sides together stitch the waistbands to the corresponding skirt pieces. Press seam allowance towards the waistband and grade the seam allowance. Insert an invisible zipper to the center back of the skirt, butting the top of the zipper coil with pressed crease of the waistband. Use a standard zipper foot to sew the center back seam below the invisible zipper. 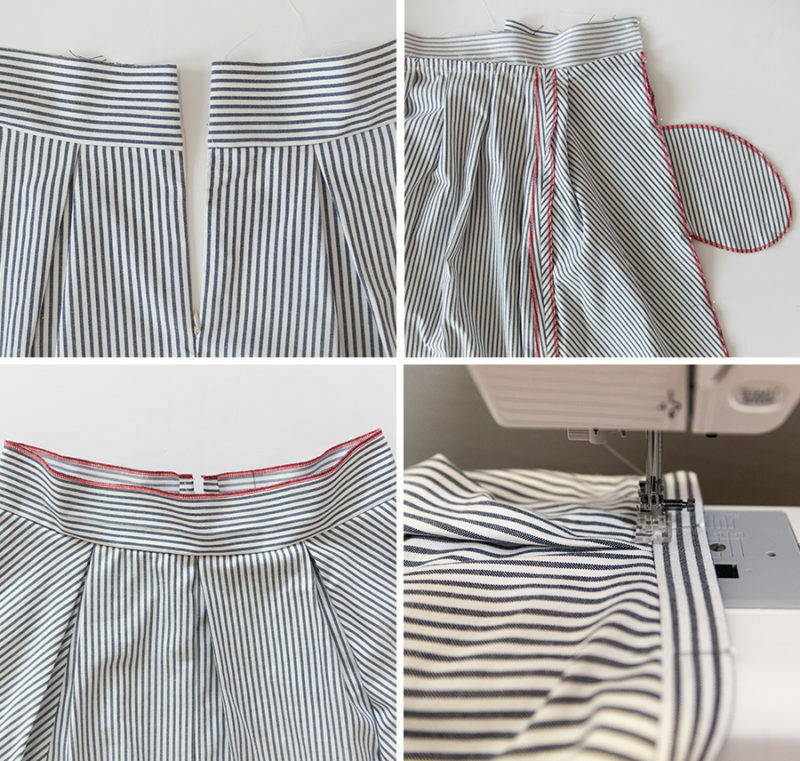 Finish the un-stitched portion of the waistband by serging or by pressing the raw edge toward the wrong side of the waistband at 1/2″. Stitch in the ditch to secure the finished edge of the waistband to the skirt. And just like that, you have made a Rue skirt! This number will definitely be popping up in my sewing queue again. It is hard to resist a twirly wardrobe staple like this one. I can’t wait to make one of these! 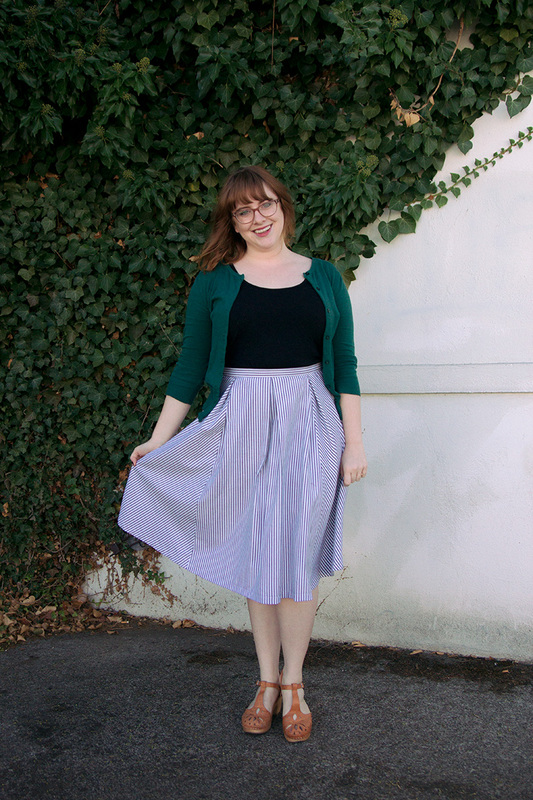 Did you use a serger when you constructed the Rue Skirt? Hi Mary, I used a serger to finish the seams, but a zigzag stitch would also do the trick! Amazing! that is really lovely. I love your choice of the fabric with the thin strips. Beautiful! 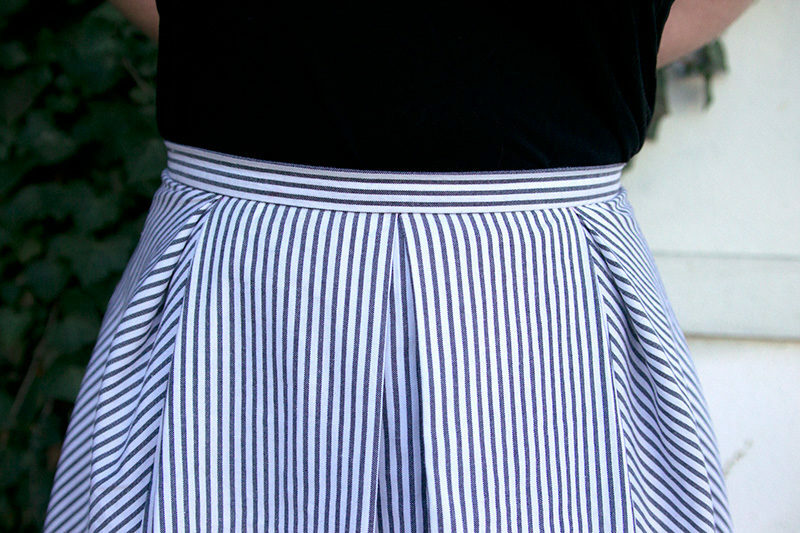 I just loves stipes with the Rue Dress and Skirt! Would you mind sharing what fabric you used? Hi Ainsley, It was purchased locally from the bargain bin section of the fabric store. The fabric is a slightly spongey cotton canvas, pretty similar to this Robert Kaufman fabric.